Mix the grated cheese and flour in a bowl. Pour the white wine into a pan and heat until boiling. Reduce heat and gradually add in the grated cheese and flour mix, whilst continually whisking. Cook gently, until mixture is smooth; adjust consistancy with a little more white wine if needed. Do not let it boil. 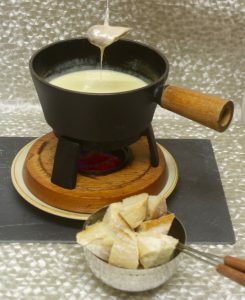 Use fondue prongs to dip cubed bread pieces into the cheese and serve.